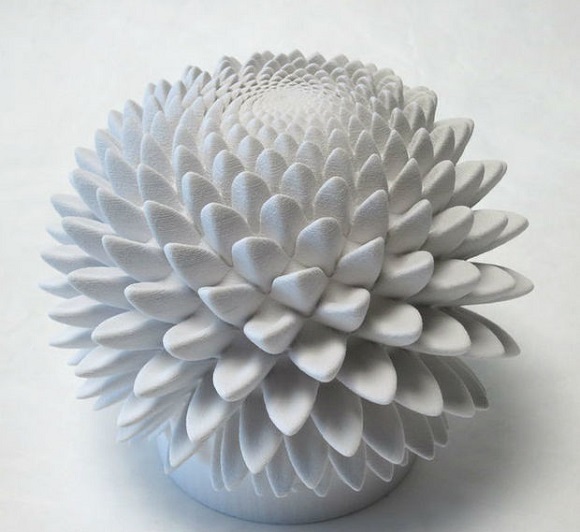 John Edmark, a design lecturer, has invented a number of designs for 3D printed sculptures, which happen to move using the effect like a zoetrope. On DIY website Instructables Edmark shared the clues on how to create his zoetrope sculptures. They mainly derive from the commonly existing and appearing in nature examples of the “golden angles” and the Fibonacci sequence. When the sculptures go round on a revolving base, their patterns and leaves go up and down as they are exposed to a strobe lightning. The designer teaches at Stanford University and at the same time runs his own company. His designs are the part of his being an artist in residence for the popular DIY network – Instructables – owned by Autodesk (the software giant) since 2011. In the Instructables post he explained that when you watch for some time one petal making its way out and down, what you are watching is in fact all the petals on the figurine appearing in order of respective distance from the top-center. The positioning of the additional parts on the figurines is of top importance to achieve animation effect. The positions ground from a special leaf order, which can be noticed in nature in various botanical forms – sunflower, palm trees, artichokes, pineapples, pinecones and other succulents. There are three major versions for the sculptures to appear: a segment coated with cube-like angles, which looks as though they burst out of the surface; another one is made up of stacked bladdery doughnuts pierced with holes and a number of things with petals. In the petal composition one fragment looks almost exactly like an anemone, whereas the rest resemble artichokes. To produce a model for each of the designs Edmark worked from top in a downward direction. 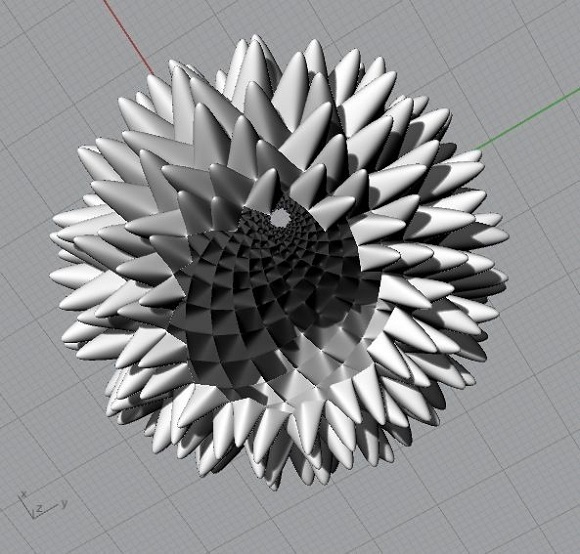 Every single petal is arranged around the central core at a 137,5-degree angle from the previous one. This angle is a very special one, it’s also known as the “golden angle” as it is based on the golden ratio. In nature such an angle results in creating the spiral patterns. If you count all the spirals in such patterns, they will always be a Fibonacci number. The Fibonacci sequence is a range in which each subsequent number is the sum of the two preceding. The sequence got its name after Leonardo of Pisa, more known under the nickname Fibonacci – which is considered to be the shortened form for “filius Bonacci”, or “son of Bonacci” – after the scientist who introduced such a sequence in his Book of Calculation to the western scientific world in 1202. The computer designs of such statuettes were developed with Rhino software and Python – a scripting program. They were exported as files and printed on a Zprinter 450. You can order the ready-made sculptures from Shapeways. You are also welcome to download the files to print them at home, if you contact Edmark via the Instructables website. There are also detailed instructions and useful tips on how to recreate the sculptures and rotating base as well as the speed, at which the light has to flash in order to produce a zoetrope effect. The Blooming Zoetrope Sculptures are not Edmark’s first project. 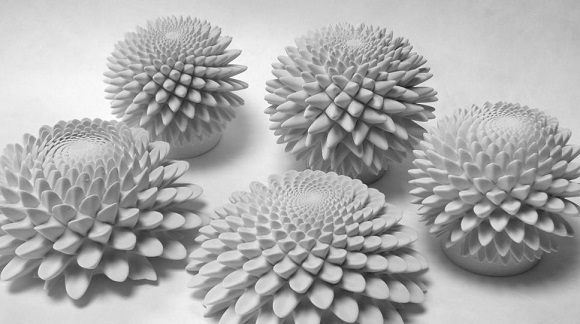 His previous projects include rotating wooden spirals, a Fibonacci sequence puzzle a range of fragments that combine water and air with ping pong balls to produce kinetic art works.